SuperKlean Model 6000M offers a single valve hot or cold water station specifically designed to provide individual outlets of hot or cold water. The unit uses two connection nuts for superior flexibility during installation. SuperKlean’s inlet & outlet have the same dimensions as most of our competitors’ stations. Our stations come with a mounting plate for easy behind the unit cleanup and hose rack for easy user access to the hose. 6000BM-S-T 300 series stainless steel, single ball valve hot or cold water wall mounted station. Includes hose rack, mounting plate, and temperature gauge. 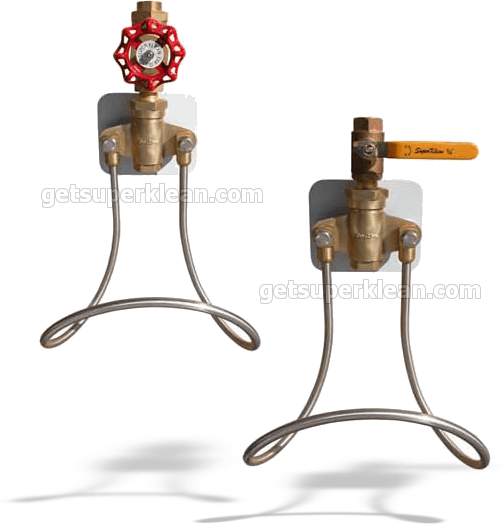 6000M-S-T 300 series stainless steel, single globe valve hot or cold water wall mounted station. Includes hose rack, mounting plate, and temperature gauge. 6000BM-S 300 series stainless steel, single ball valve hot or cold water wall mounted station. Includes hose rack and mounting bracket. 6000M-S 300 series stainless steel, single globe valve hot or cold water wall mounted station. Includes hose rack and mounting bracket. 6000BM-B Brass, single ball valve hot or cold water wall mounted station. Includes hose rack and mounting bracket. 6000M-B Brass, single globe valve hot or cold water wall mounted station. Includes hose rack and mounting bracket.